Much like the engine of a new automobile, a new subwoofer must go through a short but important process of 'break-in' before it is run under harsh conditions. The 'break-in' process will ensure the subwoofer is able to perform as it has been designed to. This process involves subjecting the subwoofer to no more than low-to-medium volume levels for a number of hours in the enclosure. 3-4 hours is generally sufficient for the subwoofer's suspension to loosen enough to prevent the voice coil(s) from overheating and causing failure. The break-in period is also effective in extending subwoofer life. Over-driving the woofer before it has been properly broken-in will usually result in premature failure and poor performance. 10 Drywall Wood Screws (Wood screws are the type of screws; the screws are actually made of metal). 12 Feet of 14 AWG Blue Speaker Wire. 2 Spade Terminals. 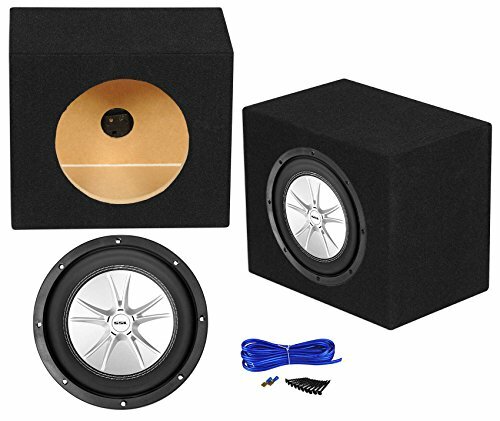 This accessory package includes everything you need to install one subwoofer into an enclosure, and wire to connect the enclosure to your amplifier. This package is a top of the line accessory package which we put together and tested. The drywall wood screws were hand selected by our installation experts because they drill into the enclosure very cleanly, without chipping the enclosure. The speaker wire is 14 gauge. This is way better than using 16 gauge. You can be 100 % sure that your enclosure will have a clean signal to the amplifier with this top of the line speaker wire. These spade terminals have also been hand selected by our installation experts to make the internal wiring simple, secure, and to run the audio signal cleanly. SoundStorm SLR8DVC 1000 Watt 8" DUAL 4-Ohm DVC Car Audio Subwoofer Sub. 8 inch 1000 Watt Dual Voice Coil Subwoofer. Power Handling (Peak): 1000 Watts. Impedance: Dual 4 Ohms. Resonant Frequency: 44.8 Hz. Sensitivity (1 Watt/1 Meter): 83 dB. Cone: Polypropylene. Voice Coil: 1.5" Copper. Terminal Type: Push. Basket: Stamped. Surround: Rubber. Insulated Lead Wires. Dimensions: L 9.3" x W 9.3" x H 4.8". Mounting Depth: 4.2". RMS: 500watts. Polypropylene cone. 2" copper voice coil. Top-mount depth: 4.1875". Cutout diameter: 7". Sensitivity: 83dB. Resonance Frequency (Fs): 44.8. Recommended Enclosure Specifications. Recommended Enclosure Type Ported / Vented. Optimum Sealed Box Volume .35 cubic feet. Optimum Ported Box Volume 65 cubic feet. Rockville RSE8 Single 8" 0.55 cu. ft. MDF Sealed Car Sub Box Subwoofer Enclosure . Single 8" Sealed Compact. 5/8" MDF. Compact Design. Durable Black Carpet. Air Space: 0.55 Cubic Feet . Mounting Depth: 6". Height: 10". Width: 12". Depth: 8".